We sat down for some tay and scones with ComedyDublin which was quite tricky given how busy they are! If they’re not doing improv, they’re holding stand up comedy nights for charitable causes. So lets find out more about them..
Margo Carr, Gaby O’Reilly, Conal Carr, Conor Doyle, Mark Hanratty and Therese Ballantine. 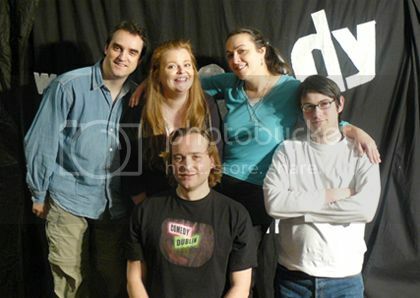 ComedyDublin was formed in 2004 and came from the ashes of the ComedySportz Dublin group and various other trainers. Most of us are comedians and actors so it was lovely to be connected in a fun way doing comedy improv. At most there have been 9 of us in the group and since Conal and Margo became parents the twice weekly shows took a back seat. Now we do monthly charity shows with special guests from UK, US and all around the world. As an actor Margo was always seeking work. The opportunity came to study comedy improv in 2000. She jumped at it and after 3 years training in Second City Teachings she joined a local improv troupe ComedySportz with Sandra Austin. ComedyDublin was set up in April 2004. Conal and Therese trained with ComedySportz (CSZ) Gaby and Mark trained with ComedyDublin as Margo was then doing the workshops. Conor had come to us after studying improv in Canada. He returned to finish his studies and we were delighted to welcome him back into the fold again. American comedy features quite strongly and we loved all the past alumni of Saturday Night Live especially John Belushi, Dan Ackroyd, Chevy Chase, Gilda Radner, Steve Martin and many more. Everyday Irish humour comes into it too and we are not that physical a group so we rely on repartee and funny lines. Everyone in the current line up of ComedyDublin also does a sideline in Stand Up Comedy. Because of the sheer fun of it. We give over so much control to our audiences that it terrifies some but it does delight the audience and they can really say they were part of making our show happen in the funny way that it does. Some of your troupe have accents. Are you all really from Dublin? No not all of us are even from Ireland! We got the name ComedyDublin.Com before we were set in stone as a group and we are always welcoming visiting improvisers to gig with us. Gaby is from Germany. Kate Higgins is from Portland Oregan, Bethanne Linstra is from Kansas, Jani Sumak is from Slovenia, Rich Jackson and Dominic Manfredi from Nat Turner Revue are from New York. ComedyDublin are performing on Wednesday 13th November at 6:30pm!